The leader of the Bangladesh’s independence movement, Sheikh Mujibur Rahman, helped create a sovereign nation, successfully taking on Pakistani occupying forces only to lose his life soon after coming to power. Britain relinquished its rule in the Indian subcontinent in 1947 and the area was carved into separate political entities. “East Pakistan” (now Bangladesh) was declared a possession of “West Pakistan” (now Pakistan). The capital was in Islamabad, 1000 miles from East Pakistan, with India in between. Sheikh Mujib, as he was known, led the people of East Pakistan – the Bengalis – in their resistance against the Pakistanis. The Pakistani military’s nine months of genocide against the Bengalis resulted in massive death and displacement. Indian intervention led to the defeat of Pakistan and creation of the independent nation of Bangladesh. 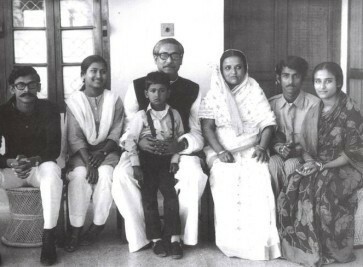 Sheikh Mujib became President of the Provisional Government of Bangladesh, then was elected the country’s first Prime Minister in a landslide victory on March 7, 1973. He, his wife, three sons and other family members were assassinated in a military coup on August 15, 1975. William Scott Butcher, interviewed by David Reuther in December, 2010, was the Bangladesh desk officer from 1971-1973. Charles Stuart Kennedy interviewed Sidney Sober in February 1990; he had served as the Deputy Chief of Mission in Rawalpindi, Pakistan from 1969-1973. Kennedy also interviewed Stephen Eisenbraun, Bangladesh desk officer, Bureau of Intelligence and Research, 1975, in December 2004. Please follow the links to read more about post-colonial upheavals, South Central Asia, and to read the account of Consul General Archer Blood, who wrote what is considered the most strongly-worded dissent cable in U.S. diplomatic history about U.S. reaction to the massacre of Bengalis. BUTCHER: Despite the cyclone disaster, elections were held as scheduled on December 7 (1970) in all but the most affected areas in the delta region (of East Pakistan). By all accounts, these were free and fair elections, perhaps the best by international standards in Pakistan’s history. In the past, there were multiple parties in Pakistan, but the overall governing party was the Pakistan Muslim League, the PML, which basically had been riding high since independence (from Britain) and had strong representation in both wings. Well, lo and behold, in this election, because there was so much dismay and dissatisfaction with the central government, the East Pakistan-based party, the Awami (Peoples) League with Sheikh Mujibur Rahman as its leader won all but two of the parliament seats at stake from East Pakistan. On Pakistan’s one-man, one-vote electoral basis, this meant that the more populous East Pakistan had a clear majority of seats at stake for the National Assembly, as the Pakistani parliament was called. Then the Awami League surprised everyone by winning outright a majority in the prospective National Assembly, and Sheikh Mujib, as party head, was on track to become the new prime minister of Pakistan. 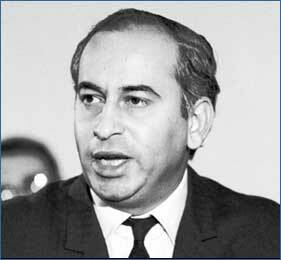 However, ambitious populist West Pakistani politician Zulfikar Ali Bhutto, whose Pakistan Peoples’ Party had won the majority of National Assembly seats contested in West Pakistan, along with other power brokers in West Pakistan, could not countenance the prospect of the Bengali nationalist leader becoming prime minister. 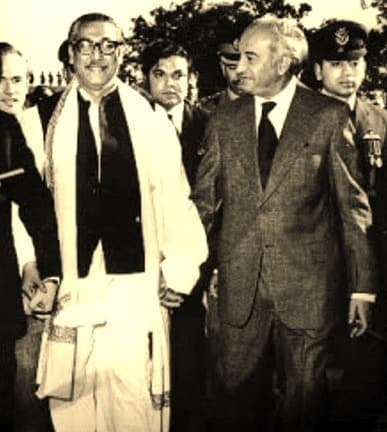 Bhutto (seen at right) saw Mujib as an obstacle to his own goal of becoming prime minister. Others, including the military, saw Mujib’s “Six Point Plan” for East Pakistani autonomy, which would devolve key budgetary and other powers to the East, as threatening their vested interests and constituting a roadmap to independence. The military and the traditional Pakistani ruling elite saw India as Pakistan’s existential threat, and in that context, viewed Mujibur Rahman as a handmaiden of the Indians. The Awami League and its supporters felt the East would finally have its day in the sun, whereas key elements in the West saw the Awami League’s platform as irreconcilable with their key interests. Easterners felt too much spending had gone to the military and that the long-standing confrontation with India over Kashmir was not a critical issue for them. This divide, exacerbated by the unstable election results with the majority parties being exclusively regionally-based, without national reach, evolved into a huge crisis, as the gulf between the evolving political forces in the East and West wings widened, and positions hardened. It was especially clear that ruling elites in the west found it hard to reconcile with the fact that Sheikh Mujibur Rahman’s Bengali-centric Awami League had won a clear-cut majority of the National Assembly seats. The die was cast when on March 1, 1971 Yahya [General Yahya Khan, the Chief Martial Law Administrator of Pakistan] announced the indefinite postponement of seating of the National Assembly, in effect annulling the election results. In East Pakistan, there was an immediate outcry. People poured out onto the streets in protest as word of the announcement got out, leading to a province-wide civil disobedience movement that went on for several weeks. To their credit, despite growing anger directed to them, being spat upon and having their movements disrupted, the Pakistani military overall was remarkably restrained in the face of the province-wide non-cooperation movement. In the third week of March, Yahya, Bhutto and other West Pakistani officials and figures flew over to East Pakistan, ostensibly in good faith efforts to negotiate a resolution to the impasse with Mujib and his team. After several days of talks, with reported ups and downs, there was no breakthrough. By March 25th things looked like they were approaching a crisis…. 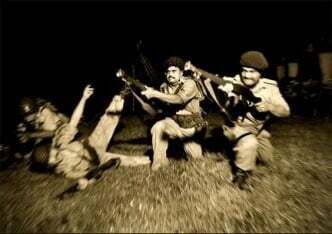 The brutal and bloody army crackdown on the night of March 25/26, 1971, as pent-up military emotions were unleashed with vengeance. There was automatic gunfire about 1:30 a.m. outside our residence as the army moved in to seize Sheikh Mujibur Rahman, who lived about nine houses away down our street. The curfew confined us to our house for the next 36 hours as we listened to heavy gunfire and viewed smoke from burning structures all over Dhaka. And then after the curfew, all of us gathered at the office to compare notes, and systematically seek out information on developments. Reliable reports of atrocities, summary executions, killings on Dhaka University campus. Acquaintances dead; others terrorized. Bodies on streets, fields, stacked in parks. [We initiated] evacuation of dependents and non-essential personnel. In the context of what we saw as silence from Washington on the brutal crackdown, widespread killings and atrocities, and lame appeals for all parties to eschew violence – when it was clear the violence was being meted out by the Pakistani military and not the initially cowed public – we decided to convey our concerns to the Department. After consulting colleagues – all unanimous in our views – I drafted a telegram dissenting with U.S. policy toward the crisis, and for failure to decry the brutal military action. …After a relatively short period after the war ended, the Pakistanis released Sheikh Mujibur Rahman, who had been in captivity in West Pakistan since he was seized at his residence down the street from us on the night of March 25th -26th, 1971. Early in 1972, he and a number of his colleagues who had been arrested and taken into captivity in West Pakistan were allowed to come back. They headed the newly established Bangladesh government in Dhaka. SOBER: Well, it was an honest election. It was remarkable in that it was the first time such an election had been held since 1947. Mujib won 167 out of 169 contested seats in East Pakistan, which was to give him an absolute majority in the National Assembly. That was December of 1970. Then the question was when would the National Assembly be convened by Yahya, and what’s going to happen? Well, what would have happened, what everybody saw was inevitable, was that with an absolute majority of parliament, Mujib, the leader of the Awami League, would become the Prime Minister. Now that caused a great deal of concern among a variety of people in West Pakistan, because Mujib had been campaigning on what you might say was really a nationalist platform of so called Six Points, which would have given a very high degree of autonomy or self-rule, short of actual independence, to East Pakistan. There were some people in East Pakistan who were calling for UDI, Unilateral Declaration for Independence. There was a long history, which we won’t go into, of troubles between East and West Pakistan because they are of quite different ethnic, cultural and linguistic backgrounds, although the mass on both sides are Moslems–which is the reason why the one state of Pakistan had been created. But there was a feeling, pretty wide-spread in East Pakistan, that they hadn’t been dealt a fair deal. That they had been exploited by the more powerful political, military, commercial, financial elements of West Pakistan; and they wanted a better deal. The prospect of being ruled by East Pakistanis was, quite frankly, not one that many West Pakistanis could take easily to. Then there was, beyond that, a concern, and this was surely a concern of the top military, whether these Six Points would lead to the inevitable break-up of Pakistan, as a first step on the way to a break-up. Six Points would have allowed foreign affairs and defense to the central government, but very little else. There was a concern that Mujib and his followers would then take the next, what appeared to some to be the next logical, step towards breaking with Pakistan. There was a lot of dispute as to whether East Pakistan was a politico-economic plus for Pakistan as a whole or not. But East Pakistanis felt, to a large extent, that they had been milked and they would be a lot better off as independent, to be free. Among the military, I’m sure, there was a deep concern. I think they thought that if push came to shove, their major responsibility to the nation as patriots, as servants of the state, was to maintain the integrity of Pakistan. Integrity is a word we use all the time. We favor the integrity of Lebanon, whatever that is. We favor the integrity of this country and that country. So saying that they wanted to preserve the integrity of Pakistan is something one could understand. But in a very troubled history, where east and west had not gotten along so well…. So Mujib would not have been the first East Pakistani Prime Minister, but he would have been in an assembly which really had the power, to which he was responsible. Not responsible to a President or a Governor General. Well, he would be the Deputy Prime Minister. He had won an absolute majority of the assembly seats in the December ’70 elections in West Pakistan. So he was clearly the number two man, but he didn’t begin to have the number of backers that Mujib would have in the Assembly. A lot has been made as to whether Bhutto, presumably not willing to be number two, not willing to be anything but number one, didn’t have a hand in making sure that the Assembly didn’t get convened. There was a lot of politicking involving visits by Yahya as well as Bhutto to Dacca [now Dhaka] to meet with Mujib. They were not able to come to an agreement. And ultimately on March 25, 1971, three months after the election, the Pakistani military, which had been ferried over by air, over Sri Lanka (that’s another story, why not over India?) from West Pakistan, had been reinforced in East Pakistan in anticipation of a possible crunch. And in fact on March 25, they were let loose. I would call it a military riot. We use the term police riot. That was the beginning of the civil war, with some very gross abuses of force by the Pakistan military. It was the beginning of a war that only came to an end in December when the Indians mopped up the Pakistani forces. EISENBRAUN: In the summer of 1975, Sheikh Mujibur Rahman was the self-appointed president of Bangladesh, which had become independent only at the beginning of 1972. Sheikh Mujib was a Bangladesh national hero and had been the symbol for the resistance of the Bengalis against the Pakistanis, although he spent the time of the fighting in prison in Pakistan. When he came back to the new country of Bangladesh in early 1972, he was given a hero’s welcome and was named prime minister. But he wasn’t an administrator, and the country had great needs. He responded by consolidating power in his own hands. Bangladesh was falling into an autocratic form of government. It was terrible, actually, in the summer of 1975, I guess, to be on the streets of Bangladesh. 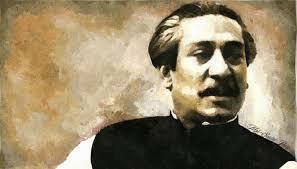 Mujib had established his own private security force that ferreted out dissenters for punishment. The private security forces, called the Rakkhi Bahini, snubbed the army, which had fought for independence, so eventually, plots of coups developed, even threats to Mujib’s life. People in Bangladesh would whisper this to the embassy. This reporting was coming back to Washington so steadily that it became clear that this isn’t idle chatter. Sheikh Mujib’s life seemed in danger. I remember the discussion of whether we had an ethical responsibility to warn Sheikh Mujib about the danger to his life. The decision was that, yes, we did have that responsibility. And the Ambassador [Davis Eugene Boster] did go in. He went in to Mujib, this would have probably been late July or early August of 1975. I might have drafted his talking points, but I can’t remember for sure if I did. Anyway, the essence of what Boster was instructed to say was, we hear many threats of a coup and threats of violence against you. He didn’t name names. He merely warned Mujib to be careful. As my memory has it, Mujib was casual about it and said, don’t worry, I know my people; they love me and everything’s under control. Well, the last day of my assignment on the Bangladesh desk was Friday, August 15, and I had essentially checked out. All I had to do that morning was just come in and say goodbye because the next Monday morning I was starting Bengali language training at FSI. Ann Griffin as the desk officer had come back and taken over responsibility the day before. So I came into the office that morning to absolute hubbub. There was frenzied activity because Sheikh Mujib and all of his family had been assassinated a few hours earlier. Yes. It was a horrible massacre, where renegade mid-career army officers had come to his house in the middle of the night and shot him and his wife and all the children, probably well over a dozen people. Bangladesh generally doesn’t have that culture of violence, but there had been considerable violence since the struggle for independence, starting in 1970. People were desperate. There is, I guess, a history of sporadic but great violence all over South Asia that has broken out occasionally when the tensions have become too great to bear. This was one of those times. The coup plotters murdered everybody with automatic weapons. It seemed not so different from the killing of the royal family in Russia in 1918. My memory has it that the actual perpetrators, the majors who did it, were not necessarily the ones we’d been hearing about in the days before the coup. The Americans were caught as much by surprise almost as much as the Bangladeshis. I say this because there was one surviving member of the family, the daughter, Sheikh Hasina, who was not in the country at the time. In 1996, she became Prime Minister of Bangladesh when I was serving my second tour in Bangladesh, and I know that she believes the Americans knew about the assassination plot in advance and did nothing to stop it, and in fact may have had a hand in it. It’s my understanding from working on the desk in 1975 that the Americans did warn Sheikh Mujib, as I described; but that they were surprised by the people who actually carried out the coup and the assassination. Believe me, it was a shock on the desk that day. Sheikh Mujib had no administrative ability, and as it turned out, an authoritarian streak. He was turning Bangladesh into a dictatorship and not addressing the tremendous economic development problems. . Ambassador Boster wanted to keep the U.S. at arm’s length from Sheikh Mujib as Mujib became more and more authoritarian and was suspending rights and was developing his own personal army, practically. We had an economic aid relationship as we poured in a tremendous amount of resources, a lot of food aid because the needs were limitless. They were recovering from a devastating hurricane just before the war, then nine months of civil war and genocide; the humanitarian needs were infinite, and we responded generously. However, we made a distinction between the economic assistance and the political sphere. 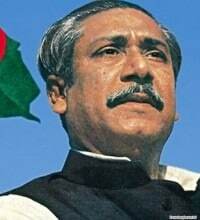 Mujib was willing to be friendly with the Soviets and the Soviets had a huge presence in Bangladesh. He talked socialism, which was not welcome in Washington. 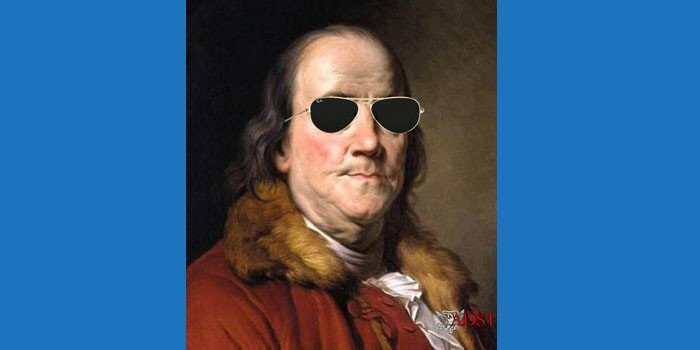 His comments on that score were essentially rhetorical, since I don’t know that he particularly implemented any policies that you could say were socialist; he didn’t have very much structure in his government, frankly; the Bangladeshis were still groping to put together a government. So our relationship was cool politically, and Kissinger hadn’t the time of day, as the Secretary of State, for Sheikh Mujib.